Last evening I finished the backing for my quilt in progress and sandwiched and pinned this monstrosity of a quilt. Look at the folded picture you can see it is going to be a heavy quilt. It measures 78" x 97" using queen size 100% Warm and Natural batting. 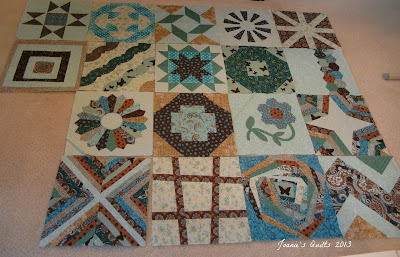 While rolling all over the floor pin basting the quilt I changed my plans on how to quilt it. I thought I would line quilt it. I am going to stitch in the ditch the frames and sashing and possibly line stitch in the sashing as well. For each of the t-shirts I want to match the thread and do large stipple quilting. I think if I lined quilted through the shirts that it will take away rather than enhance the t-shirts. Every step completed seems like major progress! Yet I'm chomping at the bit to start something else. For A Lovely Year of Finishes I included t additional quilt tops to be finished. It will be a race to finish with only 11 days left in the month. I have 2 more blocks to make. I may need to frame them since I wasn't consistent with background fabric to pull the blocks together. I will be sharing these WIPs at "freshly pieced" and "Fiber of All Sorts." Thanks to both for hosting these linky parties! 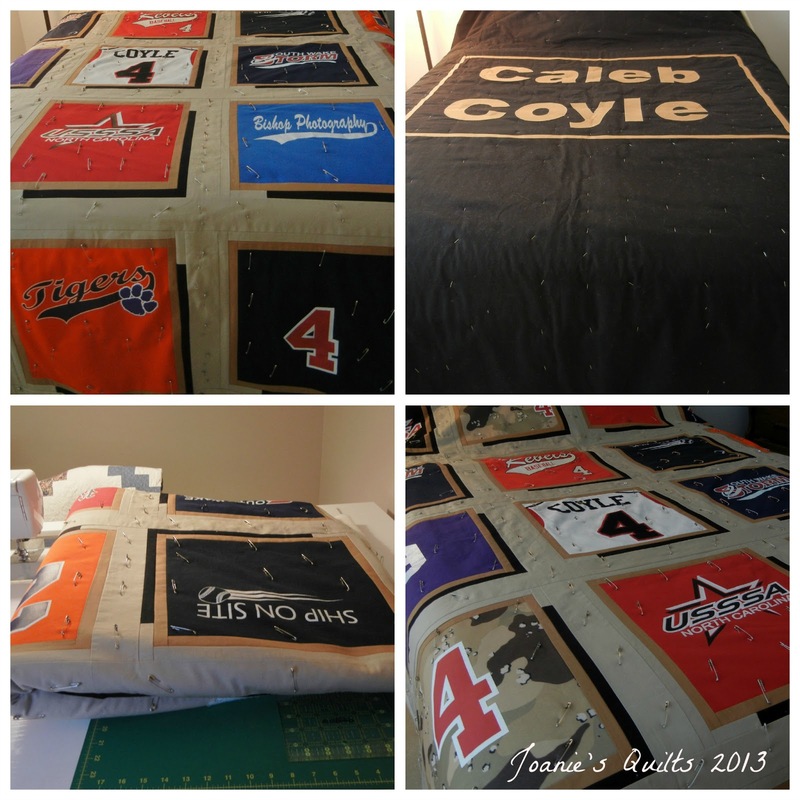 The tshirt quilt is coming along great! I do like your idea for quilt! The sampler is beautiful, lots of awesome blocks. Joanie, I really like the way you added shadows to the t-shirt quilt blocks. It makes the quilt much more visually interesting. It's probably too late for this quilt, but when I do a big one like this I use Polartec polyester fleece instead of batting and backing. It's much lighter than Warm and Natural and warm and so cozy, too. Best for cool or cold climates.